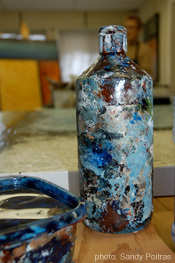 Students will explore a wide range of colour combinations, surface textures and various experimental acrylic painting techniques including mixed media applications on heavy paper, boards or canvas. Suitable for all levels of painters who are open to the expression, experimentation and exploration of the art making and painting process. Let your creative energies surface while experiencing the joy of discovery as you play and learn what it takes to make abstract paintings work.